Middlesex University has been ranked as the best modern university in London for research power an industry assessment of research quality and impact across all UK universities has revealed. The result, in the Research Excellence Framework (REF), represents significant growth in many research areas at Middlesex. It sees a big climb up the rankings for research power, a measure of the research quality and the number of people conducting it. Middlesex is now 11th in London for power and close to the top third across the entire sector. Across the board Middlesex received high marks for its research quality and impact, with 58% of its research being classed as world-leading and internationally excellent. The figures also show 92% of Middlesex's research is internationally recognised, which is a significant increase compared to the 77% score from the last assessment in 2008. Carried out by funding councils, the exercise measures the quality and impact of research conducted by all British universities across a range of subjects. Research within the creative industries at Middlesex was highly commended for research power - Art and Design: History, Practice and Theory (ranked 19th in the UK); Music, Drama, Dance and Performing Arts (14th); and Communication, Cultural and Media Studies, Library and Information Management (18th) among the highlights. There was even more success for Middlesex in Social Work and Social Policy (ranked fourth) and Computer Science and Infomatics (13th). Middlesex's research has real-world impact, with 100% of Geography, Environmental Studies and Archaeology research was found to have very considerable or higher impact, while 40% of Social Work and Social Policy and Music, Drama, Dance and Performing Arts research was deemed as having outstanding impact. Research power is a measure of the research quality and the number of people conducting it, and provides a good indicator for future quality-related research funding, estimated to be £1.6 billion a year for the next six years across the sector. Commenting on the REF results, Middlesex University Deputy Vice-Chancellor Academic Waqar Ahmad said: "I am delighted that our continued major investment in staff and facilities has been driving up the quality of our research. "Our research has real-world impact. The result demonstrates how our research is changing the world across disciplines, sharing our knowledge to deliver positive outcomes for society. We will continue our strategy of investment in research to gain even greater outcomes." 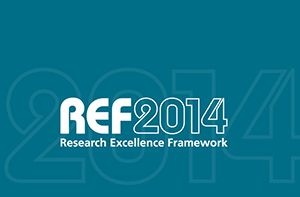 The REF measures the quality and impact of research in UK universities across all disciplines. The results are used by funding bodies to allocate block-grant research funding to universities from 2015-16, estimated to be £1.6 billion a year for the next six years across the sector.